You are here because you are interested in learning how to become a vegetarian. Maybe you are thinking of making the switch because of health reasons. Or maybe your personal or religious beliefs have you making the change. Whatever the reason is for you wanting to become vegetarian, you are a little worried. How do you make the switch from eating meat to eating a plant based diet? What meals can you eat and maybe the biggest question of all, will you even enjoy being vegetarian? This is critical because at the end of the day, if you can’t enjoy the foods you are eating, no diet is going to work long term. This is why so many people fail when they cut out sweets from their diet. They love these foods and never eating them again without a plan is simply unrealistic. In this post, we are going to walk you through everything there is to becoming a vegetarian, give you the best vegetarian tips for beginners, and advice for how to ensure that you are successful at it. You’ll even find some amazing vegetarian recipes that will make the transition a smooth and easy one. What are common vegetarian side effects? How can I lose weight as a vegetarian? What is a simple vegetarian shopping list? How do vegetarians get enough calories? How to become a vegetarian on a budget? What are the health risks of becoming vegetarian? Before we jump into all there is about being vegetarian, you need to understand what a vegetarian is. a person who does not eat any meat, poultry, game, fish, shellfish or by-products of animal slaughter. There was a time when people used to follow this diet due to religious and spiritual reasons but now with better research, many people have decided to be a vegetarian due to its many benefits. However, it should be mentioned that being a vegetarian is not the same as being a vegan. Vegetarian diets have existed for a long time. In fact, many reports say people used to follow vegetarian diets as far back as 700 B.C. On the other hand, vegan diets are fairly recent. Since both are quite similar, people often get confused between the two. The reality is a vegan diet is a stricter form of a vegetarian diet. Technically speaking, all diets are designed to serve one purpose: make you fitter and healthier. Vegetarian diets are no different. They’re designed to provide you with all the nutrients but without consuming meat, poultry, game, fish, shellfish or by-products of animal slaughter. Despite this, many experts believe a vegetarian diet to be complete and quite beneficial. Let’s have a look at some of the benefits of a vegetarian diet. When you eat a vegetarian diet, you typically consume foods that are rich in certain nutrients including folate, magnesium, fiber, potassium, and antioxidants. However, not all vegetarian diets are equal and some may contain a lack of vital nutrients. This is why it is important to pick the right diet. A lot of people opt for plant-based diets as vegetarians are said to be thinner than non-vegetarians. In fact, a report showed that a plant-based diet can help you lose about over 9 pounds in just 18 weeks. However, again, you will get the desired results only if you choose the right diet. A plant-based diet is said to control blood sugar levels and also improve organ health, especially the heart. In fact, vegetarians are said to have a better control over blood pressure, a 78% lower risk of type II diabetes, and a reduced risk of cardiac issues. There are many more vegetarian benefits but these are the biggest reasons most people opt for this type of diet. While there are numerous vegetarian benefits, there are also disadvantages to eating a vegetarian diet as well. It is important you know these before deciding if this is the right diet or lifestyle choice for you. While a vegetarian diet does come with added vital nutrients listed above, by passing on meat you do miss out on some key nutrients. The biggest are iron, vitamin B, and zinc. By missing out on these nutrients, you could experience hair loss, depression and anemia. While these nutrients are found in many plant based foods, the human body doesn’t absorb them as easily as it does from meat. Luckily you can take supplements to help reduce your risk. I wanted to talk specifically about protein because this macronutrient is a key part of any healthy diet. Most people get their protein from meat. But when you eat a plant based diet, you miss out on protein. And without specifically finding other ways to get proper amounts of protein, you can suffer side effects. 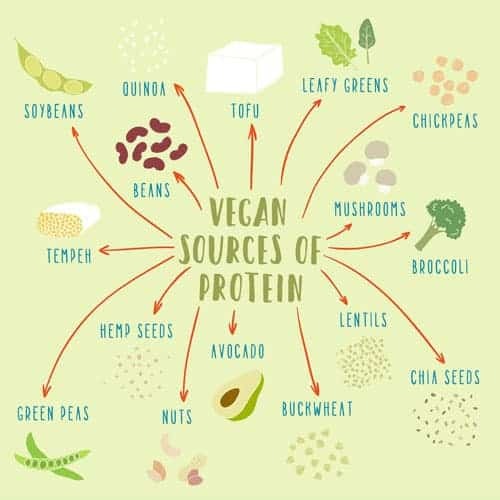 In the below image, you can see many simple ways to get protein in your diet while being vegetarian. I’ve found the best sources of protein tend to be nuts and lentils, but the others on this list work well too. Eating a vegetarian diet has many health benefits, but you have to actually eat healthy. Some people simply cut out meat from their diet and think that they are leading a healthy lifestyle. But this isn’t the case. You have to consume leafy green vegetables, fruits and nuts to see the positive impact of a vegetarian diet. You cannot simply eat pasta and french fries thinking this diet will improve your health. When talking about vegetarians, it is important to understand that there are different types. Not all vegetarians are the same. There are different types of vegetarians based on the type of diet they consume. These include the following. Vegan: As explained earlier, vegans abstain from all kinds of animal products and by-products. Hence, they do not consume eggs and dairy products, in addition to meat, fowl or fish. Moreover, they also do not use gelatin, honey, wool, silk or other animal products. This is the most strict form of vegetarians. Lacto Vegetarian: Lacto vegetarians use dairy products like milk, yogurt, and cheese, but stay away from meat, fish, eggs, or fowl. Ovo Vegetarian: Ovo vegetarians consume egg products but stay away from meat, fowl, fish, or dairy products. Lacto-ovo Vegetarian: The most common type of vegetarians, lacto-ovo vegetarians are a mix of the two forms discussed above. Lacto-ovo vegetarians stay away from meat, fowl or fish, but consume eggs and dairy products. About 2% of Americans are said to be lacto-ovo vegetarians. Pollotarian: Pollotarians stay away from fish, seafood, or red meat. They are semi-vegetarians and consume fowl and poultry. Pescatarian: While many people don’t include pescatarian as vegetarians, let’s add it to the list for the sake of knowledge. Pescatarians are people who consume fish but stay away from meats. Flexitarian: The opinion on flexitarians seems to be divided as well. They’re occasional vegetarians who consume a plant-based diet but with a bit of meat here and there. They, at least, put in the effort to reduce meat consumption. Knowing these different types of vegetarians is important as you search for recipes online. If you include the type of vegetarian you are in your search, you will find better results. According to a report by Huffington Post, about 84% of Americans return to consuming meat after promising to abstain from it. We understand it can be quite difficult to stay committed to your goal. You’ve been consuming meats and meat-based products all your life and you suddenly want to turn green. It’s good but it’s difficult and you’re not alone in this. The posts on Instagram are good for starters but they’re usually not enough to keep you motivated. Let’s have a look at some vegetarian tips for beginners to help you succeed. The most important thing is to find the motivation to stay away from what you love, assuming you love meat and animal products. It wouldn’t be much of a battle if you’re already against the idea of consuming meats or animal products. Motivation can come from anywhere. Think of your appearance and health first. If you need to get in shape, you can use a vegetarian diet to lose weight. However, the problem is that you may feel demotivated once you achieve your goal. For example, you lose weight and then go back to consuming meat. This is why considering your overall health may be a better option. As mentioned earlier, vegetarian diets can reduce the risk of certain diseases, including many types of cancers. This can be a good reason for someone to give vegetarian diets a try. There’s a substitute for everything, from meat to milk. You only need to find the ‘right’ substitute. We know you miss burgers, so why not try a veggie burger? If you make it right, it will taste just like a burger or maybe better! While I am not a vegetarian, I do use this trick to reduce the amount of meat I eat. I have found adding sauces and spices to vegetables goes a long way to making the meal just as good. In fact, we highlight a few meals with meat substitutes later in this article. It may be a good idea to surround yourself with people who share the same mindset as you. Being a part of the ‘vegetarian community’ can give you the push that you need. They’ll remind you why it is important to be a vegetarian and stick to your goal. You may opt to join societies nearby or try online forums and clubs. All that you need is a person who appears as excited about your plan to turn vegetarian as you are. Other than this, also let others know you’ve turned vegetarian so that they do not invite you to BBQs and other such events as it can be difficult to stick to your goal if you’re constantly surrounded by such foods, especially at first. However, eventually, you will develop a nerve of steel and what’s being served around you will stop bothering you. But until that happens, you need to put in the effort to keep your distance. You do not have to turn into a vegetarian in one day. You can start by taking mini steps. It may sound exciting to turn vegan in a day but it can be quite challenging. You can start by choosing to be a flexitarian first and then moving up the ladder. For example, avoid consuming meats on weekdays. Once you achieve that, you can eliminate other meat-based products as well or turn lacto-ovo vegetarian. Starting extreme would cause you to get bored in no time. You need to give your body and mind time to get used to your new dietary habits. Plus, when you start slow you will also have the time to see the changes in your health and body. Do not let the smell of food entice you. Avoid looking at food pages that cover meat-based products so that you do not feel the urge. If you find you cannot stop thinking about food, then spend time looking for vegetarian recipes and note the ones that you are excited to try. If you think being a vegetarian means you cannot eat out then you’re wrong. There are many vegetarian restaurants out there that serve delicious vegetarian food. This can be an excellent way to open your eyes to all the available vegetarian dishes for you to try and fall in love with. Find your favorite restaurants and enjoy dining out with your friends. You may even try to introduce your friends to the idea of turning to a plant-based diet. It is normal for others to questions vegetarians. Understand that these people are ignorant and they just don’t understand the reasons why someone would eat a vegetarian diet. Do not let their jokes or taunts get to you. Stick to your goal and stay away from people who try to push you far away from your aim. As we noted above, there are many substitutes you can use as a stand in for meat. And if you prepare the meal right, you will have no idea you aren’t eating meat. This is what happened in our household. I found a recipe for Kung Pow Chicken and replaced the chicken with cauliflower. I didn’t tell anyone I was doing this and halfway through the meal, my wife finally realized she wasn’t eating chicken. We all loved it and I am not a fan of cauliflower at all. But it opened my eyes to the power of substituting meat and using the correct blend of seasonings and spices. You can use these foods to make everything from a good sandwich to a fulfilling burger. How you ask? Let’s have a look at some nice and easy vegetarian recipes for you to make. Do not worry about having to find vegetarian meal ideas. We have some great vegetarian recipes for kids and adults. You can enjoy these vegetarian dishes for breakfast, lunch, and dinner. While the recipes below are great for any vegetarian, even kids, the next section has specific vegetarian recipes for kids, since they can be more picky eaters than adults. This amazing breakfast meal (courtesy of Primal Desire) is made in an Instant Pot, so it won’t take you long until you can sit down and enjoy it. The best part is you can even use this as a tasty treat throughout your day! If you enjoy Mexican fare, you can’t go wrong with this tasty breakfast dish (courtesy of A Simple Pantry). Not only is this a vegetarian meal, but it is packed with protein to help you start your day on the right foot! While granola is great on it own, when you add in chocolate chips and mint on top of it, it becomes an irresistible dish (courtesy of Veggie Inspired). You can make this meal quickly and be satisfied for hours! Growing up, I loved the meatloaf my Mom would make. And this vegetarian meatloaf rivals what I grew up with in every way (courtesy of All Ways Delicious). I will admit that I am not a big fan of mushrooms, but they certainly add flavor to this tasty dish. Making this dish (courtesy of A Pinch Of Healthy) in an instant pot means it will be ready to eat in no time. What made me interested in this dish from the start was the image of it. My mouth starting watering the moment I saw it. And when I went do eat it, it didn’t disappoint my taste buds either. As I mentioned, mushrooms aren’t high on my list. But they are on my wife’s and this dish is one she craves (courtesy of Go Go Go Gourmet). Not only does she have this meal for lunch and dinner, I sometimes catch her eating it as a snack! Chicken parmesan is a staple in many households. And becoming vegetarian doesn’t mean you have to give this amazing meal up. All you have to do is substitute the chicken for eggplant (courtesy of Little Ferraro Kitchen). When I first made this I was nervous because of my love of chicken parmesan. I thought nothing could substitute it. But I was wrong. My wife introduced me to Thai food when we first started dating. It was love at first taste. So when I decided to become vegetarian, I knew I had to find a replacement for the many Thai meals I loved. Thai Tofu Satay (courtesy of Simply Healthyish) was one of the first vegetarian recipes I tried and I keep coming back to it. As with chicken parmesan, pasta and meatballs are a classic staple of dinners everywhere. With Tofu Meatballs (courtesy of Healthier Steps) you get to enjoy meatballs without consuming red meat. These meatballs are great on their own or added to the pasta of your choice. You can even just enjoy them as a snack too! When it comes to vegetarian snack ideas, you don’t have to spend any time cooking or preparing. You have lots of options right at your fingertips. If you have some time to prepare snacks, you can’t go wrong with kale chips or edamame. The bottom line is that vegetarian snacks shouldn’t be an issue. You can quickly grab some fruit or vegetables to much on if you are in a hurry, or you can create a delicious snack if you ahve more time. Getting kids to eat is hard enough. Add in a special diet and all the rules go out the window. Luckily there are some simple vegetarian meals for kids that are simple to prepare and your kids will love. Here are a handful of ideas to get you started. Simple to make and fun to put together and eat. Kids will love this vegetarian substitute to the classic taco. In a large skillet, add olive oil and warm on medium heat. Add vegetables, salt and pepper and cook until soft. Usually 5-7 minutes. In large bowl, mix refried beans and spices. Combine vegetables and refried beans in skillet and mix using low heat for 5 minutes and serve. No kid can resist pasta and this vegetarian spin on a classic pasta dish will have your kids coming back for more! On stovetop, melt minced garlic cubes in skillet on low heat. In large bowl, toss cherry tomatoes, garlic and olive oil until mixed. Transfer tomatoes and garlic to baking sheet and place in oven for 15 minutes. Boil water, add in bow tie pasta. Cook until desired consistency is achieved. Take tomatoes and garlic and add cream cheese and puree the mixture in a food processor. Drain pasta, mix with tomato sauce and serve. Who doesn't love blueberry muffins? Who doesn't love french toast? Combine the two and you have an irresistible breakfast treat! Cut tops off muffins and put aside. Take remaining muffin stumps and slice half lengthwise. In bowl, mix eggs, cinnamon, and creamer. Dip both sides of muffin stump in egg mixture and place in skillet, cooking 2-3 minutes per side. 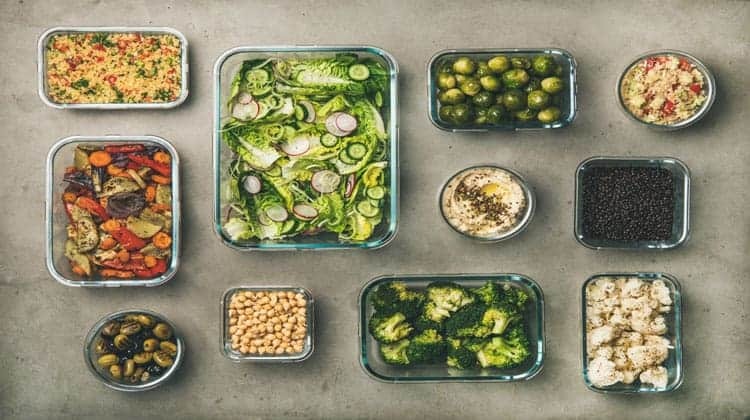 Becoming vegetarian is exciting, but chances are you have a lot of questions still unanswered about this lifestyle choice. Below is a section of frequently asked questions about being vegetarian that hopefully helps you better understand this diet. When first starting out on a plant based diet, the most common side effects will be hunger, irritability, and headaches. This isn’t because eating a vegetarian diet is bad for it. It is just your body adjusting to your new diet. Up until now, your body has become accustomed to the meat, sugar, and other unhealthy foods you were eating. These positive side effects will continue as long as you stick with your diet. Eventually, you will look back and wonder how you even functioned in before your plant based diet. The good news is that simply eating a plant based diet is going to help you lose weight. Here is how you lose weight as a vegetarian. Most fruits and vegetables have a high fiber content. Fiber helps you to feel full longer. This means you snack in between meals less often. When you cut out on snacking throughout the day, you lose weight. Additionally, you can eat a lot of vegetables and not take in many calories. In other words, you can eat a huge salad and walk away full having consumed just a couple hundred calories. If you added meat and carbohydrates to the meal, you would easily be pushing close to 1,000 calories per meal. With all this said, it is still important to work out and be active to lose weight as a vegetarian. You need muscle mass to survive long term and just eating healthy isn’t going to help you build lean muscle. There are a few staples that should make up a vegetarian shopping list. The reason is simple. These foods are inexpensive, easy to prepare and are dense in calories to ensure you are getting enough food to fuel your day. Here are the things you should always have in your house and should always be on your shopping list. By having these staples in your house, you will always be able to whip up a quick meal or snack no matter how much time you have to spare. Fats and proteins play a huge role in helping vegetarians get enough calories. This means you need to make sure you are eating nuts throughout your day as they are a great source both fat and protein. If you plan to still eat dairy products, milk, eggs and cheese are another important staple in your diet. Finally, when starting out, make sure you eat every 2-3 hours just to make certain you are consuming enough calories. If over time you find yourself tired all the time and not able to concentrate, chances are you are not consuming enough calories. It’s no surprise that eating healthy can be expensive. But there are some simple things you can to do eat a vegetarian diet on a budget. First, you don’t have to buy everything organic. Focus on buying the organic version of the “dirty dozen” and non-organic for everything else. Next, know that more and more stores are offering organic foods. You don’t have to settle for Whole Foods anymore. Take some time to take note which stores in your area offer organic products and then compare prices to see who had the best prices. But don’t just focus on price. Make sure the produce is high quality too. Some stores will sell produce cheaper because it is older and won’t last as long. Additionally, consider shopping at farmer’s markets or even joining a food share. You can get a lot more food at better prices in both cases. And with regards to the farmer’s market, visit near closing time. You might be able to haggle for extra discounts. Finally, if you have friends who are also vegetarian, consider buying in bulk. You can split the food and the cost to save money. Even though a vegetarian diet tends to be healthy for you, there are still some health risks associated with becoming a vegetarian. Lack of protein. The main source of protein in most diets is meat. Without this macronutrient, you can experience muscle weakness and a loss of lean muscle tissue. Additionally, you can compromise your immune system and get sick more often and have wounds take longer to heal. Lack of vitamin B12. Without this vitamin in your system, you can experience neurological disorders. Lack of iron. As with protein, the main source of iron in our diets comes from meat. With low iron levels you can become anemic. Lack of zinc. There are many issues when you have a lack of zinc in your body. These include hair loss, fertility issues, poor sleep, weakened immune system, and Alzheimer’s. To remedy these health risks, experts suggest you supplement your diet with these nutrients to lower your risk. There are numerous health benefits of a vegetarian diet. For starters, vegetarians have a lower risk of heart disease, heart attacks, certain cancers, and other health disorders. Of course, this goes back to the earlier point of actually eating a healthy diet of fruit, nuts and vegetables. You won’t experience a lower risk of disease if you only consume empty calories in french fries, potato chips, breads, etc. Also, if you still smoke or drink alcohol excessively, the health benefits of a vegetarian diet will be limited. According to studies, it shows that vegetarians tend to live a little longer than meat eaters. Most studies range between 3 and 7 year longer lifespan. So while you may live a few years longer, becoming vegetarian will not significantly increase your lifespan. In other words, do not expect to reverse the effects of aging simply by going to a plant based diet. Becoming a vegetarian is a lifestyle choice that you can stick to with proper planning. And with the vegetarian tips for beginners laid out above as well as the many vegetarian recipes we highlighted, you can start off your new lifestyle on the right foot. In time you will begin to experience the many health benefits of becoming vegetarian and have more focus and energy in all that you do. I think more people should try it and see how they do. Becoming a vegetarian was one of the best decisions that I ever made.